Cubetto is a wooden cuboid robot that helps young children get to grips with coding concepts through play. The robot is operated with a interface board and puzzle-like blocks. 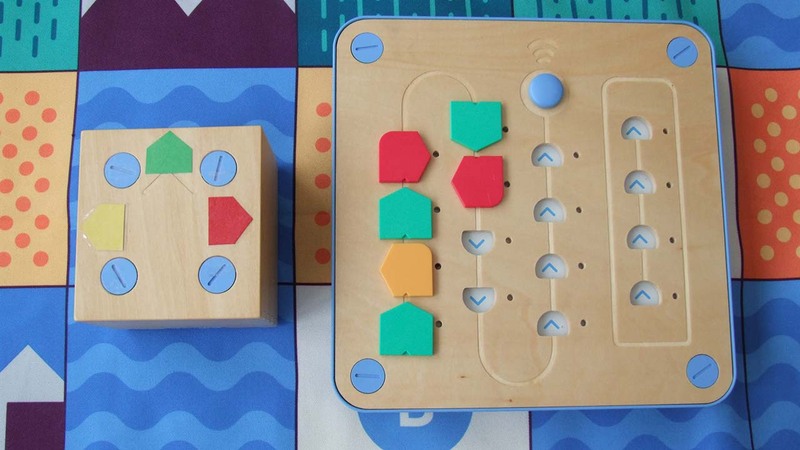 There's not a device in sight with this educational coding toy! 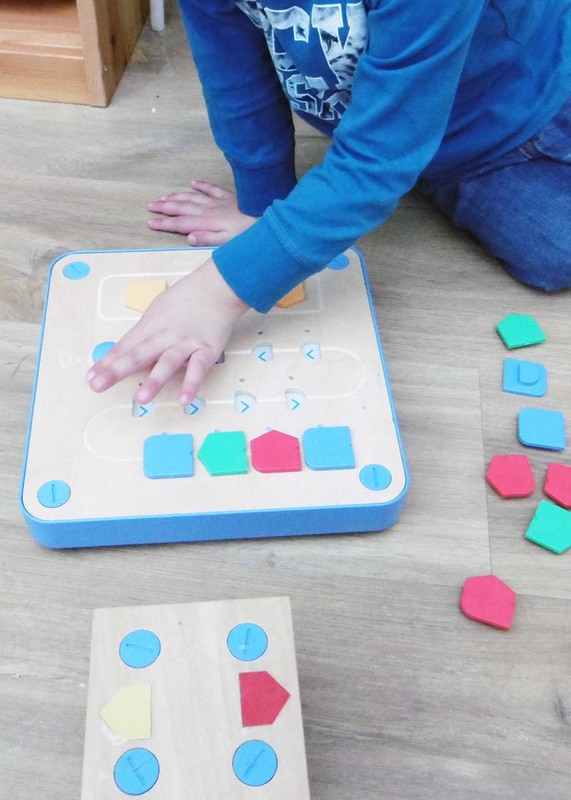 Cubetto is developed with a Montesorri philosophy in mind, where children learn best by doing, through hands-on play and independent development. Primo toys sent us a loan kit of Cubetto, which my kids (ages 6 & 8) and their friends (ages 3 & 5), enjoyed exploring. We have lots of positive comments about Cubetto and a few suggestions to consider for improvements. Disclaimer: Primo Toys sent us a Cubetto on loan to play and review. This is not a sponsored post and our views are our own. You'll need 6 AA batteries to operate Cubetto - 3 for the robot and 3 for the interface board. Be careful not to loose the little screw, as it screws out completely and yes, you'll need a star-shape screwdriver to access the battery compartment. Switch on the robot and interface board. You need to pair the robot and interface board by placing one green block on the board and press go. We had no problems with this and it worked the first time. You won't need a device to control the robot, however you may want to keep a tablet handy to access the various online resources available. There's activities and more story books available as downloadable PDFs. The video tutorials are also very useful. The play mat sent to us, is a lovely fabric world map with beautifully designed illustrations. 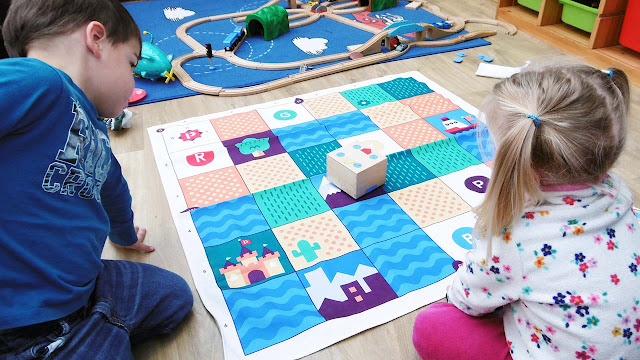 We were really impressed how easily Cubetto moved over the mat, even with creases in the fabric. It worked with the mat on a carpet or hard floor, but it was nicer to sit on the carpet and play. Cubetto works by adding "commands" in the form of blocks onto the interface board in a particular sequence. Once you press the big blue button on the interface board, Cubetto response by physically moving according to the commands. The wooden robot can move forward, turn left or turn right. There's also a special block, called a function which we'll talk about below. But note, you can't leave a gap (open space) in the sequence or poor Cubetto will get confused! Teaching children "left" and "right" can be really tricky, even adults (like me) struggle with knowing which is which. We find it fascinating that toy inventors insist on including directional commands in toys aimed at really young children. We've developed a Lego Coding Game, and a lot of thought has gone into designing a really easy way to execute "left" and "right" in the game. Cubetto, in our opinion, doesn't quite get this right. I added some indicators on top of Cubetto to help the kids figure out which way the robot will turn when they play a block. This seemed to help a lot and they were able to code by colour, rather than know the direction. I also added a more prominent arrow to show which way is "forward" as it's not always easy to know which way Cubetto is facing when looking from above. There is a carved arrow in the wood, that point forward, but it's not easy to spot at a glance. I do however like how the blocks are shaped to only fit into the interface board in a specific way. Not only is this great for fine motor skills, it ensures the pieces are facing the right way, that is if you follow the line of your sequence around the queue. Maybe it's time to develop a coding toy for really young kids, that doesn't include directional commands?!? The interface board allows kids to code first and then test what happens. Initially you may just want to give a young child the board and robot so they can learn through cause and effect. If I make a mistake I can easily change the block - I don't have to re-code the whole thing! The robot will move according to the sequence in the queue when you press the "blue button" on the interface board. We really liked how the board lights up at every step, essentially guiding the child through their code. The interface board also has a section where you can code a function. This is a more complex coding concept, but really useful to make things faster and more efficient. There are 4 spaces to place, forward, left / right blocks in a sequence. You then use the blue block in the queue and it will "play" the function. The LEDs light up on the function section too! We recommend, for preschoolers to spend enough time learning about sequences first, before introducing functions. Kids that use Scratch Jr, for example, don't yet encounter functions! In the picture below Cubetto will move 2 squares forward and turn left, 3 times ending up on the castle. Each story book corresponds to a different map. Book one is a world map, and then there are city, Egypt, deep sea and space maps to explore. The additional maps and story books are sold separately as an adventure pack. The first book seems to start with a very difficult concept - a compass. My friend commented this was a bit too abstract for her 3 year old to grasp. The books are beautifully illustrated and able readers should be able to read it for themselves. There's definitely scope for developing more stories and activities for each map. Cubetto is not dependent on the map to work. You can easily use it without a map or even map your own. 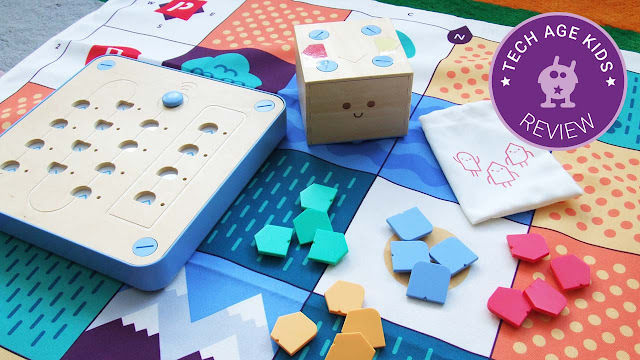 Cubetto is recommended for ages 3+ and we think it's just about right, with a few comments. Firstly the younger kids, may not grasp all the concepts, but that gives the toy longevity and something you can come back to and build on. My 8 year old enjoyed playing with it, just as much as my friend's 3 year old. They just used it very differently. Some concepts like the compass on the map, and understanding direction will not be easy for a preschooler. My 6 year old found the map useful to figure out NSWE navigation, but asked to move to south west on the map, required extra input from me. Cubetto is certainly robust enough for 3 year olds and it does look and feel like a toy for the younger age group. UPDATE 2018 Primo Toys is constantly updating Cubetto products giving the wooden robot lots of longevity and opportunities to build on your existing robot. There is a new logic coding blocks pack, which includes function, random and negation blocks. The logic pack is sold separately. If you are a teacher, there is an Education section on their website and they also sell classroom packs. There are a number of themed maps with storybooks to help give a reason for coding the robot. You can choose from Ancient Egypt, Big City, Blue Ocean, Deep Space, Polar Expedition and Swarmy Swamp. There's even one you can colour yourself, bringing tech and craft together. We really like the wooden robot, especially for young kids. It's tactile and feel robust for them to play independently. It's a shame there isn't more clear markings on the robot to help with understanding direction. The interface board helps kids "see" their code. We love how the LEDs light up so you can follow your code on the board. Sometimes it's nice to find a tech toy that doesn't require a device to operate. It makes it more accessible and parents may feel more happy with a screen-less activity for young kids. We know just how frustrating it can be if a new connected toy doesn't work with old tablets. We really liked the machine-washable play mat and very impressed how well Cubetto copes to move over wrinkles ad creases in the fabric. 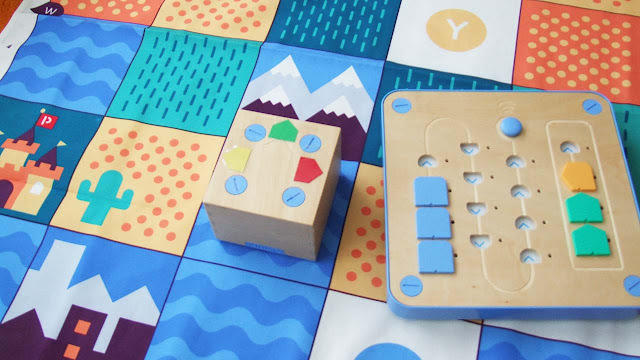 If you're looking for a coding toy for kids aged 3 - 6, then Cubetto may just be the one. There's lots of scope for learning and building on new skills. We can see how Cubetto can be a great tool for early learning and Key stage 1 (kindergarten to 2nd grade in the USA). Personally I think Cubetto is asking to be decorated! Let the kids loose with crafty things to make a costume and play out their own story on the world map.